So you want to learn how to knit. Hooray! That was me just a few short weeks ago. Yup, I’m still a beginner myself. And I would love for you to learn from my mistakes. I had a rough start of it. I just could not get the hang of it. I had to pull apart the first three projects I started. “Knitting is HARD!” I complained to my husband. But an even bigger problem, I soon realized, is that I was using the wrong materials. I was using skinny aluminum needles and thin, slippery, cotton yarn. The materials I chose were too fiddly and too small. My yarn kept slipping off my needles, I couldn’t see what I was doing, and my yarn had no give. It was stiff and tight, making it difficult to manipulate. After watching this video, I realized what I needed to do. I needed to start with different materials. So I went to my local yarn shop and selected some new needles and yarn. After re-starting with my new materials, I quickly caught on. They were much easier to use. My confidence quickly grew, and soon I was knitting and purling with relative ease. So if you’re looking to start knitting, I thought I’d pass along the advice no one gave me. some large bamboo needles and some chunky, variegated wool yarn. Let me explain the benefits of these materials. I got some US Size 10 (6mm) bamboo needles (like these). (Standard size is around size 8/5mm). 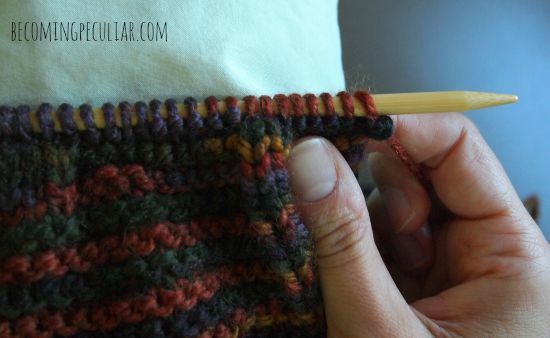 Bigger (thicker) needles makes it easier to see your work and to count your stitches. They’re also easier to manipulate when you’re still new and clumsy. Bamboo is much less slippery than steel or aluminum, so your stitches aren’t always slipping off. Newbies tend to be terrified of their stitches falling off (because it does happen), so they’re more likely to hold their yarn in a death-grip (I know I did! ), which makes it hard to knit well. With more grippy needles, you can relax a little and focus your energy on getting the movements right. A thicker, chunkier/bulkier yarn is easier to see, so you can count your stitches and keep track of your working yarn better. Variegated colour, I learned by accident, helps you to catch your mistakes more easily. If you’re working along and all of a sudden one of your loops is a different colour from the surrounding loops, you know you’ve probably done something wrong. (Perhaps you’ve dropped a stitch or wound your working yarn over your needle when you weren’t supposed to.) This gives you a chance to stop and investigate before it’s too late to fix your mistake. Oops! These last two loops shouldn’t be purple. They look out of place for a reason. The stitch must be twisted. There’s an extra loop here – don’t knit! 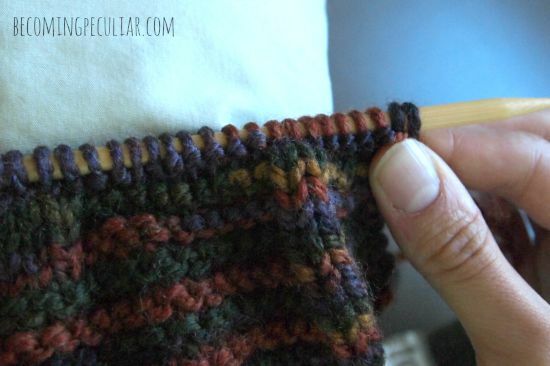 Adjust your stitches so that they match the surrounding loops. You’ll notice there’s only supposed to be one loop where you previously saw two. Ahh, that’s better! Disaster averted. I may not have caught that with a single-coloured yarn. And there you have it! 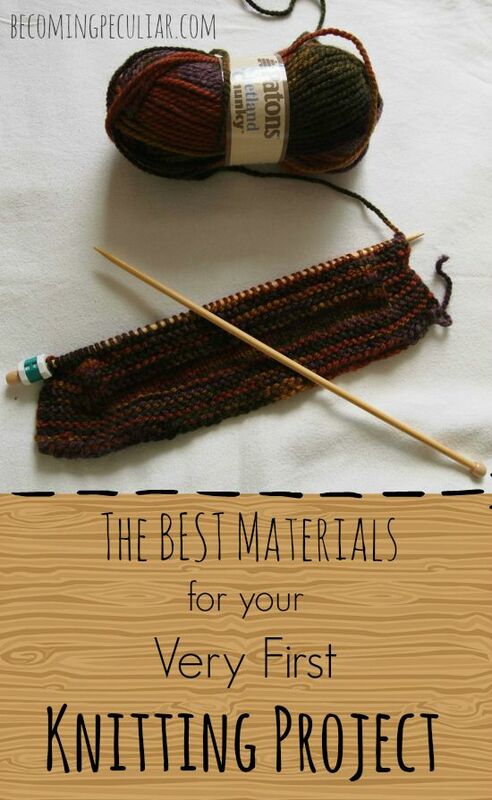 The ideal knitting materials for your first knitting project. 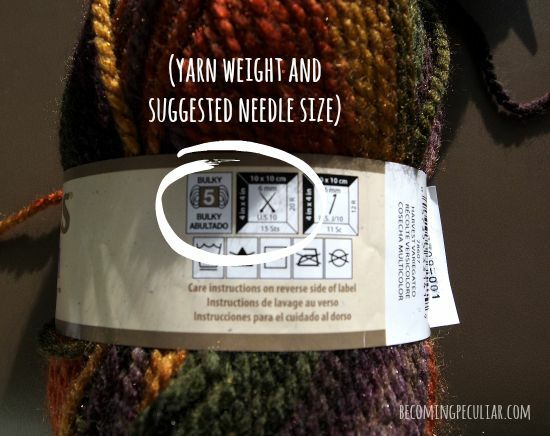 NOTE ON SELECTING YOUR MATERIALS: make sure the size of your needles and yarn are compatible. Your yarn ball band should have a recommended needle size on it. I went back and forth between a few different yarns and needles until I found a good match. In general, bulky-weight yarns work with a size 10-11 needle. Extra-bulky might require a 11 or 13. Ohhhhh! I started knitting last winter and I never thought about how useful variegated yarn would have been. I twisted stitches so often that my husband’s Christmas scarf turned into a trapezoid. PS: What’s the Lego-looking green and white thing on the end of your needle? Lol — trapezoid. I totally get how that could happen. It’s a row-counter. When you get to the end of a row you turn the dial to the next number to keep track of where you’re at. Handy! What great advice! I too had my first scarf get wider and wider because of the twisted stitch! Your knitting fever is kind of making me want to knit something! you’ve only been knitting for how long again? you sound like an old pro, you’re so dang smart! I’m so glad you’re knitting. And all of your observations are quite sound. I hate knitting on bamboo (I don’t know why, most people love it), but I can see how it would be perfect for the beginner. yay!!!! another friend with the knitting bug! 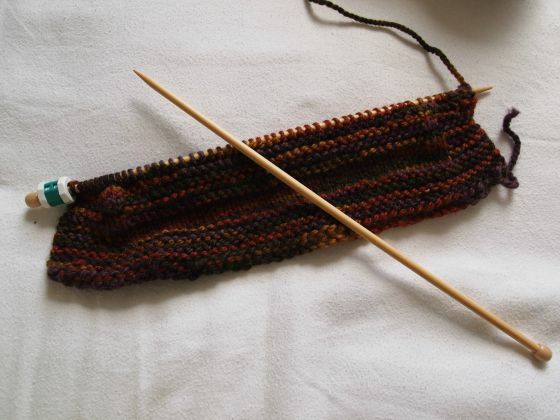 almost all of my needles are bamboo for that very reason – less slippy! and…knitting on bigger needles with chunky yarn means your project gets finished MUCH faster which i love. in no time you’ll be making cables, picot edges, applied icords, button holes, seed stitch (my personal favorite), knitting in the round, 3 needle bind-offs, ribbing, lace….oh YES YOU WILL!!! 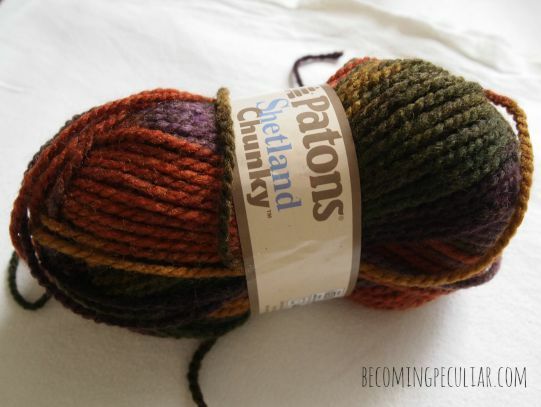 Ooh, ooh–the big question: do you knit English or Continental style? English. I crochet left-handed, so if I knit English style my right hand does the same thing in both crafts. (I WANT to be able to knit continental because it looks so much faster!) You? ?